Share your before and after pics with us to WIN! Entering our Before And After Competition couldn’t be easier! 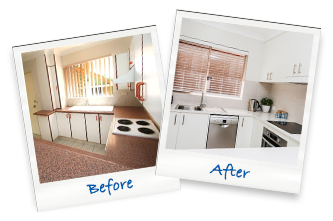 Simply take a photo of your kitchen before and after its renovation and then share those with us via our website. Each quarter we’ll be drawing one winner who will receive a $500 JB HiFi voucher. *Conditions apply. To enter, complete the form below and good luck! I acknowledge that the photos I am submitting meet the outlined photographic guidelines. I have read and agree to the competition terms and conditions. The quarterly prize package will consist of a $500 JB HiFi voucher. This competition is not a game of chance – photos will be judged on their quality and how the kitchen is presented so be sure to read our photo guidelines in full before submitting your entry.